Kakuma Camp 2, Kakuma Refugee Camp, Kenya. 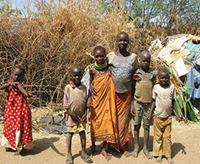 Turkana children mind each other in open spaces in the camp while their mothers go to work, either for the refugees or heading out to search for building material in the countryside. 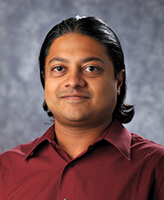 The 90,000-person Kakuma Refugee Camp, in the Turkana District in northwest Kenya, has grown into the equivalent of a permanent city—with the same level of inequity, violence and informal (black market) economic systems as urban slums, says Rahul Oka, Ford Family Assistant Professor of anthropology and concurrent assistant professor in the Department of Africana Studies. Oka has conducted five seasons of ethnographic research in the camp, where refugees from war—from southern Sudan, Somalia, Ethiopia, Eritrea, Congo, and Uganda—co-exist. In war-torn countries, nongovernmental organizations (NGOs) distribute relief supplies expensively and inefficiently, Oka says, through armed truck convoys or via airdrops. Oka’s research, supported by the Institute for Scholarship in the Liberal Arts, the Seng Foundation and the Kellogg Institute for International Studies, has shown that the informal economy—where traders and consumers actively buy, sell, and trade—plays a vital role in the life of the camp. 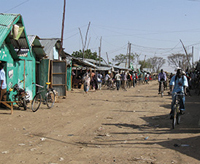 The main street of Kakuma Camp 1, Kakuma Refugee Camp, Kenya. Along the street are businesses such as electronics stores, clothing and perfume shops, groceries, schools, hair salons, and restaurants. 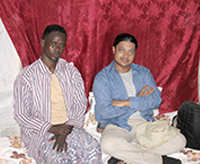 Although distribution of relief through formal channels often faces significant obstacles, Kakuma, he notes, is home to a thriving informal economy that includes more than 500 retail and wholesale shops, as well as restaurants, bars, and nightclubs—all supplied via predominantly Somali traders and merchants. Local traders, he’s discovered, are far more efficient at distributing goods than the NGOs. “Although traders come and go, the network itself is stable and resilient. They know each other through the network—and it enables trade to continue in war zones where formal institutions may not exist. Oka is currently engaged in an ongoing collaboration with the iCeNSA Network (the University’s Interdisciplinary Center for Network Science and Applications), investigating the ways the scale of trading changes as the size of the camps grow, and how external forces affect the structure of the networks over four to five years. Doing research in African conflict zones is difficult, he acknowledges. He remembers leaving a restaurant with his brother and grandmother in Pune, India, in 1981, when a violent Hindu-Muslim riot broke out. The hardest part is the children, he says. “You have to look away at times. You can’t apply the normal rules, your ideas of what children do. You see a girl of 5 helping her mother drag thorny bushes across the baking heat of the landscape, for others to make fences. One thing he’s learned is the importance of “normal” for refugees. Refugees may be collecting bland food from the United Nations World Food Programme, but they will still celebrate the birth of a baby with sweets. Tea and soft drinks will be acquired and shared at the funeral of an older relative. It creates a degree of normalcy.